One of the last places I expected to go in 2015 was Alaska, but lo and behold, crazy things happen and a few weeks ago I found myself flying to Alaska for work. If you're open to it, God will take you to places you never thought you'd end up. Do yourself a favor and don't waste those opportunities. 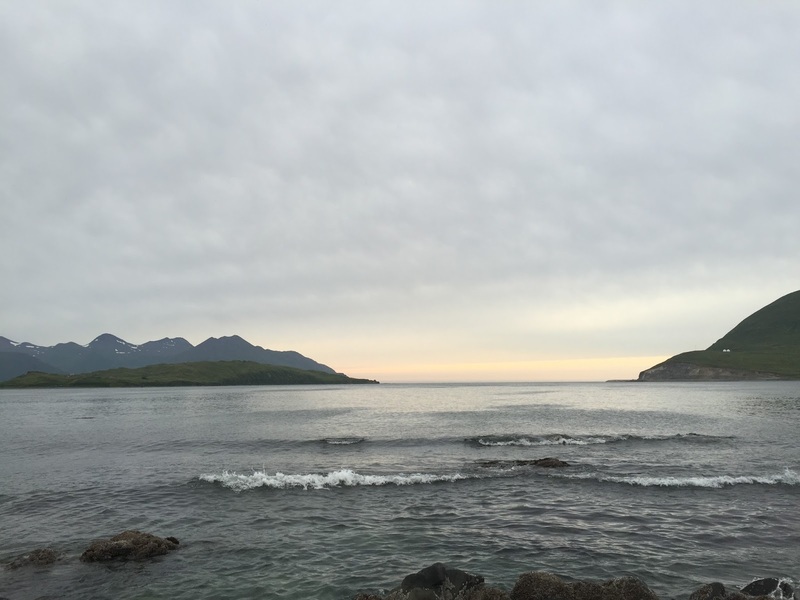 One of the first things I grabbed when I landed in Dutch Harbor, Alaska – the place where Deadliest Catch is filmed – was one of those tourist pamphlets that tell you about all the cool things you need to do while you're there. The port of Dutch Harbor is located on the island city of Unalaska (I don’t know why a city in Alaska is called Unalaska, so don’t ask me) and one of the things that caught my attention in the brochure was that humpback whales hang out in Unalaska Bay, which was right behind my hotel, in July and August before migrating south for the rest of the year. I have never seen a whale outside of SeaWorld so this was kind of a big deal, and I was determined to see at least one during my eight-day stay in Alaska. One night, I walked over to the bay around 8:00 p.m. (During the summer, the sun doesn’t set in Alaska until around 11 p.m. It’s weird.) and walked along the shore until I found a big rock with a smooth enough surface to sit on. I sat and looked out at this large body of water, my eyes fixed straight ahead to where the bay leads into the Bering Sea. I didn't want to blink and miss a whale breach or come up for air or whatever else these playful humpback whales might do, so I tried to keep my blinking to a minimum. A few minutes passed by, then half an hour and then an hour and now I started to feel the wind start to pick up and the temperature start to dip – 'flip-flop weather' for an Alaskan, which is somewhere in the lower 60s, is still chilly for most Miamians. And still, no sign of a single whale... and I started to think maybe all this whale stuff was a trick by the locals to attract tourists to their little island 800 miles away from Anchorage. I looked at my phone and saw that it was 9:15 p.m. and told myself if I didn’t see a whale in the next 15 minutes, I’d call it quits and try again the next day. That’s when I heard something off to the distance on my left, way out of my line of sight. I started to walk along the rocky shore towards the other side and saw some people standing by the side of the read next to their pulled-over cars, looking out towards this thin inlet that led into the bay. Then I saw what looked like a puff of smoke coming out of the water accompanied with a faint whoosh – the sound that had grabbed my attention moments earlier. And then another and another. Before I knew it, I was looking at a pod of at least dozen humpback whales swimming across the inlet into the far side of Unalaska Bay, coming up for breaths of air on this early summer evening. Some of the whales, as they prepared to dive deep, would reveal their flukes before disappearing below the surface. I was mesmerized, watching from shore as these magnificent creatures just hung out in Unalaska Bay, mere hundreds of feet away from where I stood. I couldn’t believe I was here – just a few months earlier, this would have been a moment I never would have imagined possible. Yet, here I was. It’s a memory I’ll never forget, and one I’ll be thanking God for for a very long time. But I never would have experienced that moment if I kept sitting on that rock, focusing on the same spot of unmoving water with eyes and ears closed off to everything else happening around me. Sometimes, we do the same thing in life – we’re looking for something and we’re looking for it in a certain direction, expecting it to just show up at some point and finding… nothing. More often than not, we lose a lot more than just an hour of time. I can’t begin to tell you the number of times I had my sights focused on a particular thing when God was gently urging me somewhere else to experience something else – something better. Come and see what I’m doing over here. Come and see how I want to use you in this area of your life right now. Come and see. We have to be willing to lift our heads, take off the blinders and look around with eyes wide open and ears ready to listen. Sometimes we're looking for the right things in the wrong places. The whales of our lives aren't always where we expect them to be. You never know what might be hanging out around the corner. The world is not perfect, so you can make friends with you. Life should be like a candle, from the top to the end, has been bright.The value of life, that is, the work done for the contemporary. i like your words and post, i will come back to see your new words again. if you want play counter strike and also want buy csgo skins cheap you can come to us.